The fantastic work Sue Ryder does for people with incurable conditions. This is why I’m proud to be part of #TeamIncredible at the 2014 RideLondon-Surrey100. This entry was posted in Cycling, Fundraising, London To Brighton, Sue Ryder and tagged #teamincredible, Cycling, fundrasing, ridelondon-surrey100, sue ryder, training, why im riding for sue ryder. Still time, but how fast will I be? As the sun starts to shine and more riding can be done in daylight without the need to wear extra layers, again my thoughts turn to how fast could I complete Ride London 100 in this summer? The first goal however is to finish and the second raise loads of money for Sue Ryder. You can help by visiting my page here. However being the type of person I am and from reading peoples accounts of last years event I have started to think about the time. When I found I had a place I thought if I could complete the course around 6.5 hours then this would be a good time. Also something I could achieve with an average speed of just under 25kph (24.7). This is well within the 8.5 hours allowed to complete the course even with a few rest stops thrown in. However my training has got me up to around 28kph which would give me a time around 5 hours 45 mins. I have even calculated 5 hours but this is a stretching 32.2kph and outside my reach. But you have to dream. Well I suppose I have now set myself another challenge, to complete this in sub 6 hours. I have a history of this as last year I set a target of sub 4 hours for London to Brighton only to be hampered by light failure, but I am sure this will be achieved soon. However this challenge is different. The last hill comes at 109.4km which then leaves a final 50k to get the power down for a grandstand finish on the Mall being cheered on by the large crowd which will no doubt push me on. London to Brighton has the big hill at the end which drains your energy and then you have no time to recover before the finish. Well it looks like the training will continue to be hard to ensure I build the power, strength and aerobic ability to allow me to travel faster and further for the same amount of input. Time to update the training plan. When you have been cycling for about 3 months then you will have the basic strength to build upon to complete your sportive or event ride. I have built this up with commuting to and from work plus the weekend longer rides. Now it is time to step up the training to improve my ability. I have found some longer routes to commute to increase the distance cycled each week, which will help, but I am going to start using the normal commute to work as shorter time trial rides and for interval training. In theory this will improve my overall moving time (average speed) to allow me to achieve the magic sub 6 hours. Then the weekend rides are for the social aspect as well as getting the time in the saddle completed. I will target certain segments on Strava and use these as markers on my progress. Hopefully come the end of June I will have seen some improvement in my general average speeds on rides and then the plan would be to keep these up on the longer rides come the weekend. This entry was posted in Cycling, Fundraising, London To Brighton, Ride London, Training and tagged average speed, Cycling, fundrasing, getting better, getting faster, getting fitter., improving, inthepeloton, ridelondon, ridelondon100, training. Training update and allowing my mind to drift into the future…. The possibilities????? It’s going well, very well so far. I might only be in the second week of my training plan but cycling to and from work with a ride on a Sunday is allowing me to hit the numbers for the early weeks. I am also starting to feel the strength come back to my legs I had last year so all is good, especially as the weight is finally starting to fall off as my body adjusts to its new regime. I have to say I am enjoying the training too. I think this is a vital way to ensure I maintain the levels I will be required to do for August. It Is easy to training when you enjoy putting in the hours. I have to say using the bike as part of the commute to work really helps as the training for these days is complete with me just getting to work and then home again later in the day. I still need to work on some items and I will share one of these with you. Whilst I fuel my body before a ride in the form of breakfast, but more importantly the food the previous day, I still send to work out what it the best food to eat whilst on the bike. 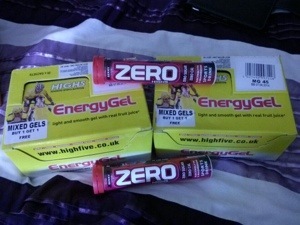 I am a fan of the high 5 gels as they taste nice and come with the caffeine option of your wish, which from what I read are very useful towards the end of a ride. I also love the high 5 tabs which you drop into your water bidons as these have the electrolytes which need to be replaced when cycling. The reason I still need to practice which fuel works do me is last year I think I might have overdone the gel consumption during the London to Brighton night ride. Let’s say I was more than wide awake for the ride and the whole day following the ride and only started to feel slightly tired when I finally got home that evening. I also don’t like fig rolls which are a good source of fuel when cycling. Looks like it’s jelly babies or Haribo for the sugar content or Jaffa Cakes, but it’s the other eagerly types I need to practice with. Well I am going to have plenty of opportunities to get the right mix of fuels for me. We are all individual but I will post what works for me if and when I find out. I think I could be even more hooked by the bike and cycling is starting to be the main choice of transport, at least in the head, even though it might not be the best option. An example of this is not wanting to reserve something in the well known catalog store here in the UK (the red and blue one) as I can’t collect in store as I want to cycle to work. The item will just have to wait until the day when I use the car again. It was only a bed anyway, it can wait. If I am going to be regularly cycling 150-250km per month when the training ramps up in the near future, what happens when the events are completed? All this work for 2014 and ride London gets me in hopefully fantastic shape but then what? This has got my mind working, well drifting again. I may need some time off from the charity bike rides, and focus a bit more on the personal challenge. I like the idea of cycling over a number of days from locations within the UK to start, but then entering Europe. The latter will certainly be 2015 at the earliest due to the planning involved for such a journey. I suppose I should look at completing one of the London to (enter a European capital here) events before I turn 40, which means I have three years left to plan and then execute my plan, however lose they are at the time of writing this post. Whatever the far fetched ideas I have for 2015 and beyond I suppose I better return to the matter of 2104 and very much the present plan and ensuring I am ready for RideLondon come August. Right in that case it’s off to bed to get the legs ready for the cycle to work in the morning. This entry was posted in Cycling, Equipment, London To Brighton, Ride London, Training and tagged Cycling, fuels, gels, ridelondon, training. The weather was lovely this weekend and just ideal for a cycle, so I have done just that. In the last four days I have ridden a total of 93.5 km which is ideal to kick start my training for Ride London later in the year. Last week I achieved my weekly goal of cycling 80 km mainly helped by the work on Friday, Saturday and Sunday. I will say that of the 93.5km cycled 39.5 has been in the gym and the rest on the road, so prober cycling. However the result will be a fitter me and km in the legs for later in the year. 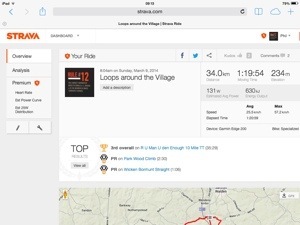 I didn’t write this post yesterday as I was a little disappointed with a 10 mile TT which a friend of mine had set up. We both had a goal of achieving this in sub 35 minutes and unfortunately I was 29 seconds over. I am sure next time I will achieve the sub 35 minutes goal. However I need to take heart from the fact the ride yesterday the ride had a number of PB’s on segments which I have to take heart from. A PB is a PB after all. I am also glad I didn’t post this when feeling down and took the opportunity to look at one of the segments from my Saturday ride. There was a segment which I had set a goal of completing in 9m30s and actually completed this in 8m39s. This cheered me up as to take 51 seconds of this time is a real achievement. So on reflection I am happy with this. I must remember in the grand scheme of things I am only battling against myself and my times. If I keep achieving PB’s then I know I am improving. I aim to increase the km ridden each week from now as the training plan kicks in. Cycling to work will certainly help. In the past I have looked for an average speed on rides of 25kph which is 4 hours for 100km and 6 hours for 150km and just under 6.5 hours for the big 160km (100 miles). I do think I might need to increase the speed for the shorter training rides as this will help my training. If I can get some 30-50 km rides in at 27-29kph and then up to 30kph this should be able to enable me to complete the longer rides at a good average speed. Well the weather is grand so far this week so let’s start cycling to work. As a famous supermarket has as it’s slogan “Every Little Helps”. If only I could earn the relevant points on that supermarkets loyalty card for every km ridden. Now there’s an idea for another blog. This entry was posted in Cycling, Ride London, Training and tagged Cycling, getting fitter., ridelondon, training, workouts.